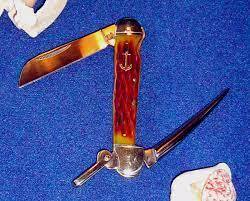 Among Rough Rider knives almost every pattern is available in Amber Jigged Bone or Red Jigged Bone. From the low model number, I assume this was the first of the Marlin Spikes. The fit & finish is superb. The amber reminds me of a dark honey amber. The anchor shield is flush with the handle as are the pins.